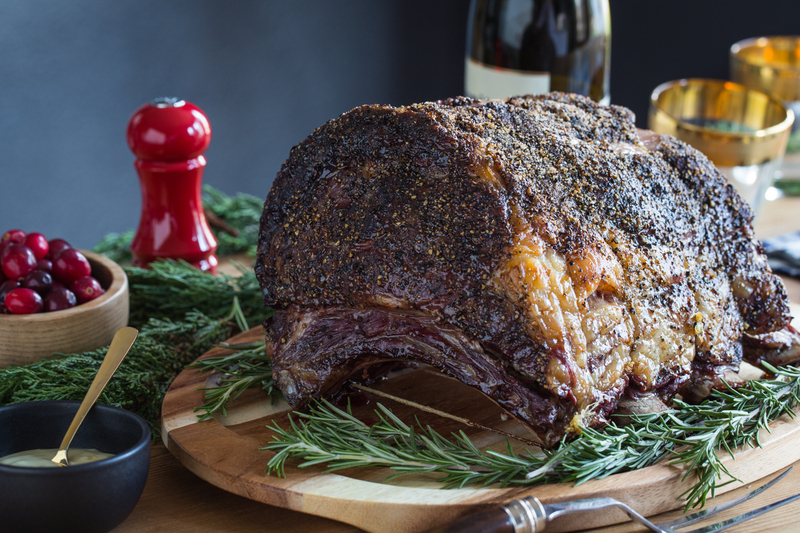 This post, Pepper Crusted Prime Rib Roast, is sponsored on behalf of the Ohio Beef Council. All opinions are my own. Thank you for supporting the brands that I love and that make Jelly Toast possible. I love this time of year! It’s the time of year when all of those “special occasion” recipes and traditions get pulled out. It is the holidays after all, and there is no time like the present to treat yourself and your family to some truly wonderful holiday recipes. 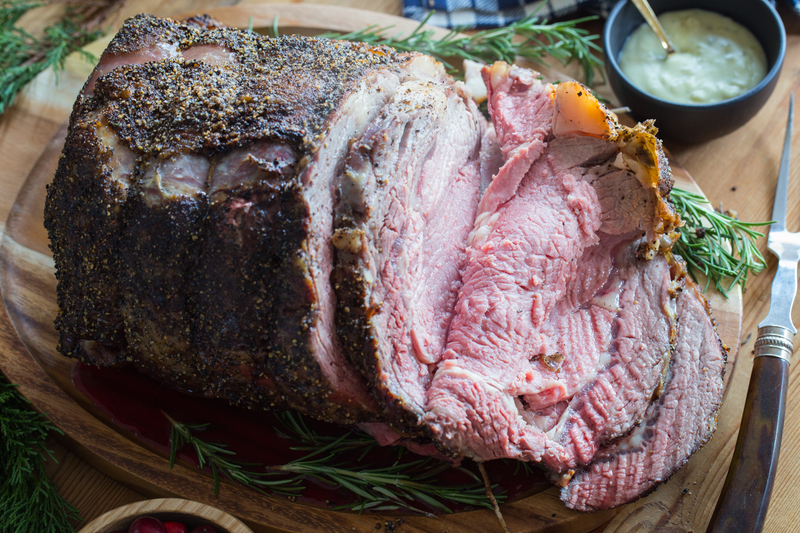 When the Ohio Beef Council asked me to share a celebration worthy recipe, I knew I wanted to try my hand at a beautiful pepper crusted prime rib roast with blue cheese sauce. I have had my fair share of prime rib at restaurants and parties, but in truth, had never tried to prepare it myself. It seemed so daunting – from the size of the roast to the sticker shock of the price of the meat. Yes, it’s true. This is a high priced roast, and there are many more economical roasts out there such as my garlic herb crusted roast beef recipe. 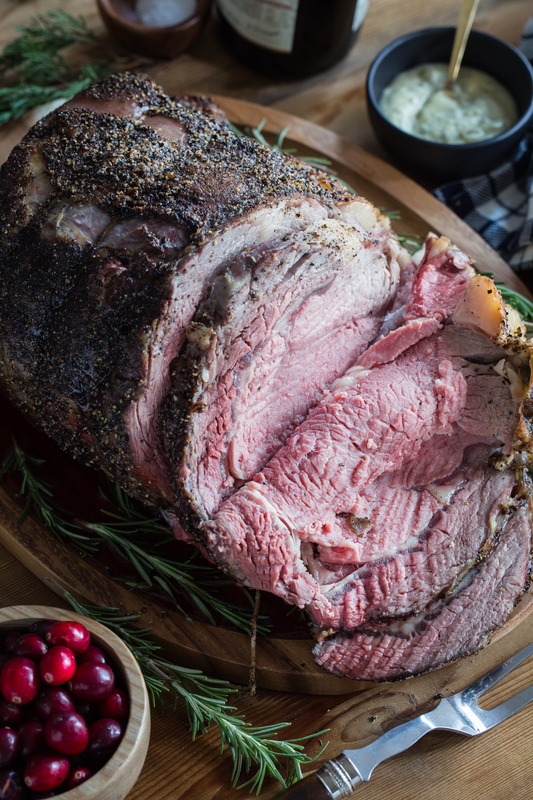 However, if you are considering preparing a prime rib roast this season but are nervous about the method, please give it a try! You will be so pleased at just how simple it is to prepare and the results are worthy of any celebration. Then whip up a batch of blue cheese sauce for serving. 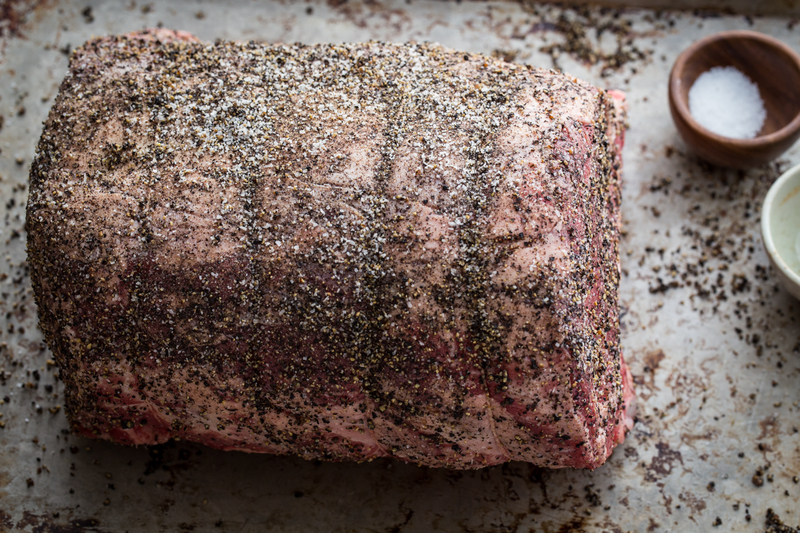 A great cut of beef needs little in the way of seasoning to make it sing. I used my favorite Certified Angus Beef and the butcher at my local Meijer store prepped it for me. He removed the ribs in one piece, but tied them back to the roast with twine. This did two things: keeping the bones on while roasting seasons the roast wonderfully, but having them easily removed after roasting allows for a simple slicing and presentation. 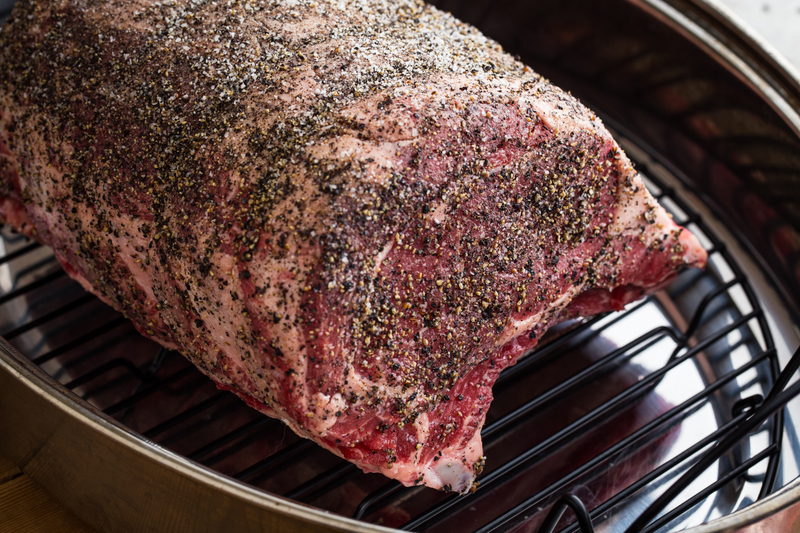 The roast gets rubbed with a generous amount of pepper and salt and placed on a rack in a roasting pan. Low and slow roasting at 220 degrees gets the roast to the perfect 120 degrees in about 3-4 hours. Be sure to have a quality meat thermometer to allow you to monitor the meat temperature. Once the meat reaches 120 degrees, remove the roast from the oven and allow it to rest for about 30 minutes. Then return the roast to the oven set at 500 degrees for about 10 minutes to create a great crust. I adapted this method from Chowhound and Alton Brown and I found that it creates a beautiful finished product. When it comes to feeding my family, I do my best to offer the most well rounded diet that I can. When I serve a fantastic beef recipe, I can be sure that in just 3 ounces, my family is getting 25 grams of protein as well as 10 essential nutrients. That is something I can get behind, especially at the holidays. And if I can be successful making this stunning roast, so can you! I am proud to be an Ohioan and come from a state that boasts 17,000 beef farming families. I have had the pleasure of visiting several beef farms and witnessing for myself just how high the quality of care is that the farmers give their cattle – even in the harsh winter months of Ohio. If you are a YouTube lover like me, check out some of The Ohio Beef Council’s videos that show just how great the Ohio beef farmers are. Remove roast from the refrigerate and allow to come to room temperature for 60 minutes. Preheat oven to 220°. Rub roast with canola oil and then pepper and salt. Place roast on a rack in a roasting pan. 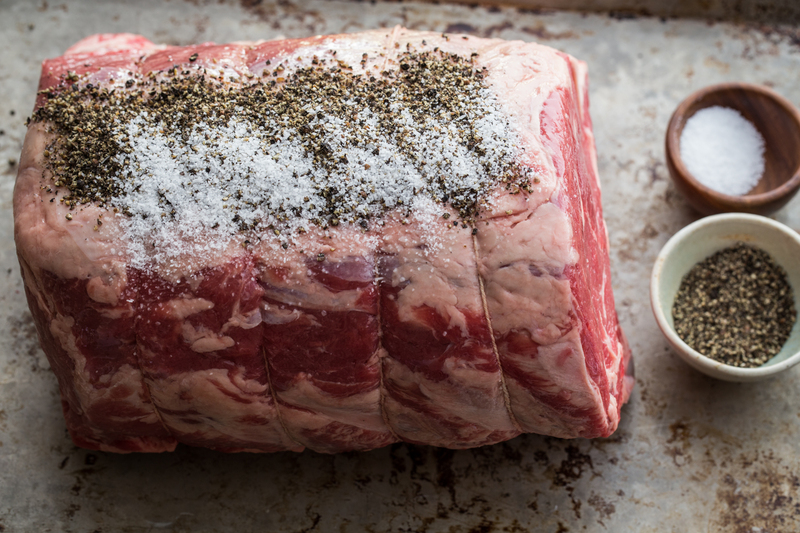 Place roast in oven and cook until internal temperature taken with an instant read thermometer inserted into the center of the roast reads 120 degrees. Remove roast from oven and tent with foil. Allow roast to rest for 30 minutes. Place milk, blue cheese, and butter in a small sauce pan set over medium heat. Stir frequently until blue cheese is melted. Add pepper to taste. Keep sauce warm for serving. Increase oven temp to 500 degrees. Place roast back in the oven for 10 minutes to sear the outside and create a perfect crust. Remove from oven and allow to sit for an additional 10 minutes under the foil tent. Slice, serve and enjoy! 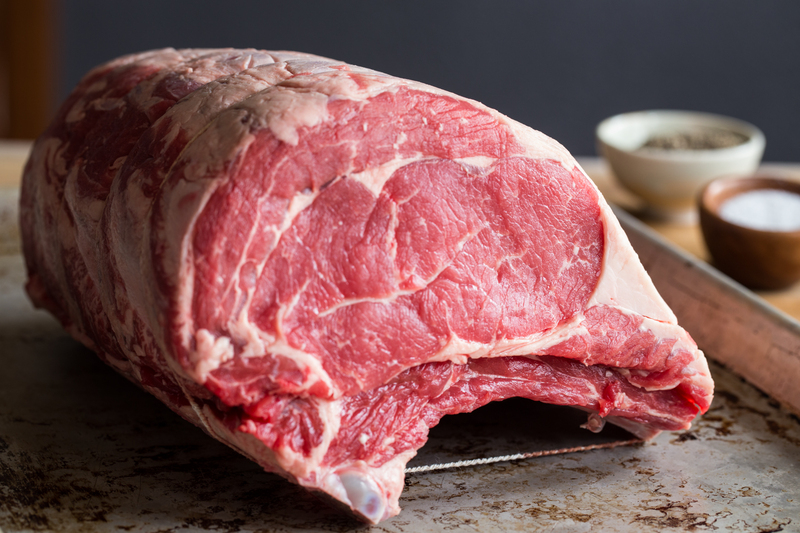 Ask your butcher to prepare your roast for you by removing the ribs in one piece and tying them back to the roast with twine. Starting at hour 2, check the temperature of the roast every hour to make sure roast is not overcooked. Recipe slightly adapted from Chowhound and Alton Brown.